Bit O' Everything: Looking for High School Class Rings? 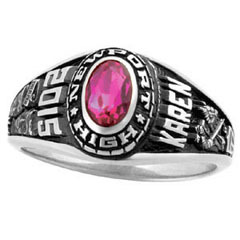 Looking for High School Class Rings? After graduating without getting a class ring, I have always wanted to find a way to obtain my high school class ring. I've been searching and finally found my answer. You see, in 1997 I didn't get the chance to get my class ring and it has been something that I've never let go of. I can tell you that if you graduated and never got your class ring, you're more than likely in the same boat. That feeling of something you should have done and never done, now it eats at you. Well, when searching, I came across high school class rings - joyjewelers.com. It's one of the sites that does allow you to design your ring for yourself. It lets you choose the style, metal, finish and even the symbols that you want on the side. You simply choose the state and then the school. It does have those for home school selections as well. Mine would look like the Select Silver, which is more precious than sterling silver. It would have my name with our high school mascot on one side, chorus and the year of graduation on the other. I'd have my birthstone in it too. Inside, it also would allow me to engrave my name or a slogan of what we had for our senior year. Borrowed from http://www.joyjewelers.com/ for post. To me, being able to take a ring and be able to design it and still be able to get my high school ring after 20 years, is an amazing thing!